The Masked Lovebird is a very popular species, second only to the Peach-faced Lovebirds, and is available in a number of attractive mutations! A beautiful bird with clear bright coloration, the Masked Lovebird also referred to as the Black Masked Lovebird, makes every bit as good a pet as the Peach-faced Lovebird. Some even suggest that they may be a bit calmer, though others say they are just as mischievous. Either way, they will make a delightful and enjoyable addition to any household. This small parrot is an excellent beginners bird being relatively hardy, easy to care for, a willing breeder, and reasonably priced. It is a most playful, intelligent, and amusing little companion. The Masked Lovebird is very social and loves companionship. Their natural behavior is to live closely with a companion so are often kept with another lovebird. Though they make a very fine and affectionate pet when hand-raised, they will need a lot of attention if kept singly. Most are kept in pairs to satisfy their considerable need for constant companionship, mutual preening, and socialization. Scientific Name: Agapornis personata personata There are a some popular color mutations of the Masked Lovebird, and while this bird is described by its face, the 'mask', the mutations are described by their body color. The most common varieties are the Blue Masked Lovebird and the Green Masked Lovebird; and then there are the more uncommon varieties such as the medium blue (cobalt) and the dark blue (slate). The Masked Lovebird is native to northeastern Tanzania in Africa. They inhabit dry areas with shrubs or trees bordering forests, usually near bodies of water. They were originally discovered in the late 1800's but were not imported until the 1920's. The Masked Lovebird is a very small member of the parrot family. They have a general green plumage. The head is brownish-black with a yellow collar around the neck. The throat and upper breast is also yellow, though with a reddish-orange cast. The feathers of the rump and onto the upper tail are bluish, and the tail also has occasional orange and black markings. The eye is dark brown surrounded by a naked white eye ring. The beak is red and the legs are gray. The females in this species are slightly larger than the males. The young are duller especially on the head and they have black markings on the beak. The Masked Lovebird belongs to a group of lovebirds called the 'eye-ring' species. There are four eye-ring species, with the other three being the Fischer's Lovebird A. p. fischeri, Black-cheeked Lovebird A. p. nigrigenis, and the Nyasa Lovebird A. p. lilianae. This group can be identified by the obvious strong ring around their eyes. They are closely related and will interbred readily if kept together, even though they are different species. It is strongly urged that you keep these species separate to maintain their natural forms, as breeding within each species itself produces the most beautiful color mutations. The Masked Lovebird will get up to about 6" (14.5 - 15. 5 cm) in length. In the wild the Masked Lovebird eats seeds as well as agricultural crops, especially maize and millets. As a pet they will enjoy a variety of seeds, fruits, vegetables, and commercial pellets. In the wild they are seen in small flocks, and occasionally larger flocks when feeding in ripening crop fields. 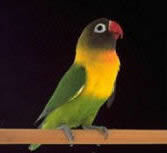 The masked lovebirds are an excellent choice for the beginning breeder. These birds will breed as either single pairs or in colonies. In the wild these birds nest in the holes of trees, in crevices of buildings, or take over the nests of swifts. When you provide them with a nest box be sure to also provide lots of willow twigs, strips of bark, or other nesting materials. The Masked Lovebird is very popular and is readily available. Please be careful on not getting a male and female from the same place! This is not getting same genes as of brother and sister. Hello! I'm going to be getting a bird (Black-Masked Lovebird) for the first time next month, I've already gotten all the things I need and have spent the past two weeks researching but, I'm still unsure about gaining trust and training my bird. Please reply with advice. Handfed black masked lovebird babies for sale in Chicago Heights, Il. $75 ea 1 mauve 1 cobalt blue 1 violet All are recently weaned and ready to meet their new families. Please email for information. Hi. I have a couple questions for you. How old are the black masked lovebirds that you have available? Would I be able to have pictures of the black masked you have for sale? And finally, where are you located and be willing to ship? I am looking for a pair of black masked lovebirds to breed. Any suggestions on where to find them? I have 16 beautiful black masked lovebirds for sales. I have had the for less than two years and started out with two and they had many baby birds. They are beautiful but I can not handle too many. Hi There, Am very delighted to let you know that i have what you are looking for now available,please kindly get back to me via email if you are still interested in purchasing. You soonest responds will be highly appreciated.